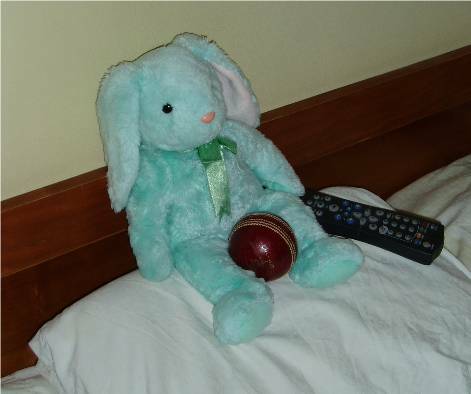 “You might fancy the attached picture of Hippity (one of Middlesex’s most ardent fans and a well-known correspondent on Middlesex Till We Die) watching cricket while sitting on the bed with his lucky ball. “Given the particular controller he is using, he is clearly watching Ceefax, which is the ardent housebound county cricket fan’s font of knowledge, as you surely know. “Again the photo is mine and I can confirm that Hippity is a volunteer for the photograph. The attached photograph is a monk at the Rumtek monastery in Sikkim brandishing a cricket bat. It is my own photo and the monk enthusiastically volunteered to be photographed. Rumtek monastery is a very holy and unusual place. The monks are black hats, which is an unusual strand of Buddhism. One can only wonder at how this lad ended up in the monastery when his enthusiasms so obviously seem to lie elsewhere. Here is a page from their website, outlinining their ‘one-day practices‘. I wonder what the monks do for first class or Test practices? 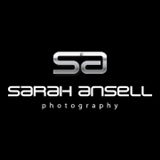 Warning: The following does feature a photograph of an actual woman. The attached picture is of Preity Zinta, a Bollywood starlet, with a cricket bat, on the cover of Vogue! I thought that was quite an unusual place for a cricket bat to be. 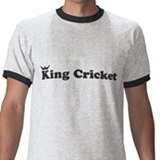 Send us pictures of cricket bats or other cricket stuff in unusual places to king@kingcricket.co.uk. Here is a cricket bat in some unusual places. Specifically, here is the cricket bat signed by the Sussex team that I won through King Cricket, from a lingerie website, around my house. 1. The cricket bat is enjoying a relaxing lie-down in my drinks cabinet. It is being protected from marauding children by a barrier of small alcohol miniatures. 2. The cricket bat is, as befits a bat won from a lingerie website, in my underwear drawer. It’s in my “everyday” underwear draw, not my “special” underwear drawer. I am aware, by the way, that my sash window needs painting, but that’s really a summer job. I’ve also been meaning to change the handles on the chest of drawers for, like, forever. Typical, isn’t it. You leave these things for ages and then it’s only when someone asks for pictures of a cricket bat in an unusual place that you think about them again. And now I feel inadequate. Great. The bag is not made of a real leopard, by the way, girls, so please don’t come round and throw paint at me. Unless, of course, you’d like to throw white paint on the window frame with a brush. 3. The cricket bat is now sitting up in my bed, as if it owns the place. It doesn’t. I do. Well, the bank mainly does. If I were a cruder person, I’d make a joke about that being the longest, thickest, hardest piece of wood that I’ve ever had between my sheets. Luckily, I’m not that person. This is more like it. Pictures of cricket bats and cricket items in unusual places to king@kingcricket.co.uk please. Here is my entry for ‘cricket related things in unsual places’. The item in question is Shane Warne’s hat and the unusual place is ‘on my head’. I’m a primary school teacher and took my class to Gloucestershire CCC for the day. We had a tour of the ground during which the chap who was taking us around (can’t remember his name, but for the purposes of this we’ll call him Brian) brought out a load of kit he’d been given by various players over the years when touring teams had come to Bristol. He then let all the kids try the kit on. One of the Indian children in my class was very pleased to wear Tendulkar’s pads. Now whilst I really should have been the responsible adult and let the kids enjoy the moment, I couldn’t stop myself from joining in and quickly put Warne’s old floppy hat on my head and took a quick pic. So quick in fact that I didn’t think to make sure I had the Aussie badge in view, so you’ll just have to take my word for it I’m afraid. We asked if there was a story of EXTRAORDINARY RAGE behind its unusual appearance. “Sadly, no. Just a rather limp medium pacer, a solid back foot push and the strange flapping sound of a previously sturdy bit of wood being held together only by two bits of bat tape. Then came a long bout of sulking. We have rather a soft spot for penguins and for the chap depicted with them, but we have a strong suspicion that this image may be doctored in some way. Ceci didn’t even try and claim that this was real. These shall be the only fraudulent submissions for this feature. May they stand as a warning to you (in a way that is not entirely clear). The first in our new series Cricket Bats In Unusual Places. Send your pictures of cricket bats in unusual places to king@kingcricket.co.uk (it doesn’t have to be bats). This account was written on the insistence of my counsellor. He says I have to face what I have done; to see my actions and their consequences for what they are. It is, to the best of my knowledge, true. I am in Oxford on my holidays. I am surrounded by book readers, deep thinkers and philosophers – my kind of people. We smile at each other as we pass along the ancient streets, happy to be clever. I know for a fact that 87% of Oxford residents actively hate cricket – they did a survey. I am in heaven. I stroll down North Parade. All is well, yet life is about to get even better. I walk past a lovely looking pub, The Rose and Crown, and hear the unmistakable, heavenly timbre of Paddy McAloon’s voice drifting out onto the street. He is singing: ‘Cowboy Dreams, you give me cowboy dreams.’ He is singing it 120 times better than Jimmy Nail sang it. I enter and order a pint of Old Hooky. It is as soothing and comforting as the music. The pub is perfect. There is a real fire, books on a shelf and clever people sat at the bar. They have Prefab Sprout on the juke box. This is my kind of place. And then I spot the cricket bat. The barkeep notices my eyes glance towards the bat. He is round the bar faster than Mark, Howard and Jason said ‘God, yes,’ when Gary asked if they wanted to give it another go. He takes the bat down and strides towards me. Jesus have mercy on my soul: he is going to talk to me about cricket. I remain aloof. Underneath this facade, anger is bubbling. “Have a hold,” he says. And pushes the bat towards me. He shoves the bat underneath my nose. “Have a sniff!” he tells me. Anger envelops me. There is only one thing can happen. I take the bat from him and emit a roar. I brandish the bat above my head and start with my wanton destruction of the pub. People scatter. Grown men weep in terror. I become more animal than man. Five minutes later it is finished. I tuck the bat underneath my arm, leave the destroyed pub and go on the hunt. I will find both Goochie and the real Graham Gooch if it is the only thing in life I achieve. Nobody ruins my holiday. Especially not a cricketer. I have to stop now. I’m getting angry again and my counsellor tells me that won’t help with parole. It’s lights out in five minutes anyway. Maybe soon I can become calm enough to write down the rest. It doesn’t have to be cricket bats – that’s just the name of the feature. It can be anything cricket-related, but it does have to be in an unusual place. The more unusual the place, the better; and the larger and more unwieldy the item, the better. Points equal nothing, however. We don’t do prizes. Maybe if you do something unbelievably amazing we’ll send you a second-hand copy of a third-rate cricketer’s autobiography, but don’t count on it. The first instalment of Cricket Bats In Unusual Places will appear tomorrow. Many of you will be delighted to hear that it’s from Brian. Future submissions don’t have to follow the same format as Brian’s. In fact it’s probably best if they don’t. Mop-up of the day – Hello and goodbye and are you leaving?